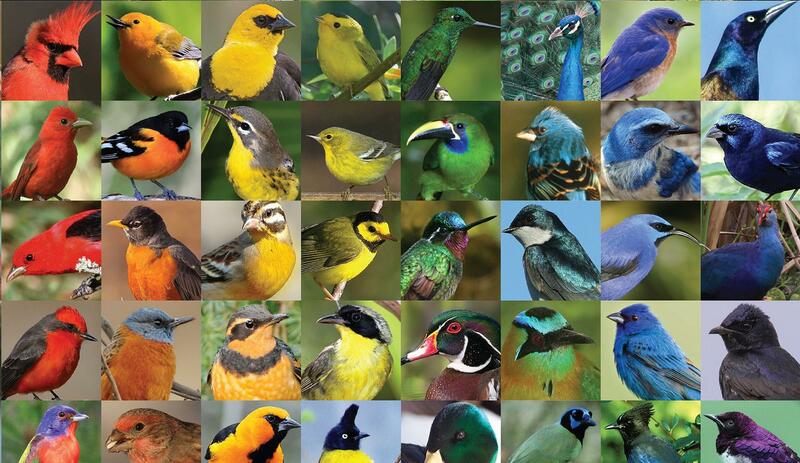 Birds display a rainbow palette of colors, many of which come from special arrangements of melanin, the pigment that gives color to our skin. Researchers at the University of Akron have developed a safe and stable pigment based on the melanin structures. 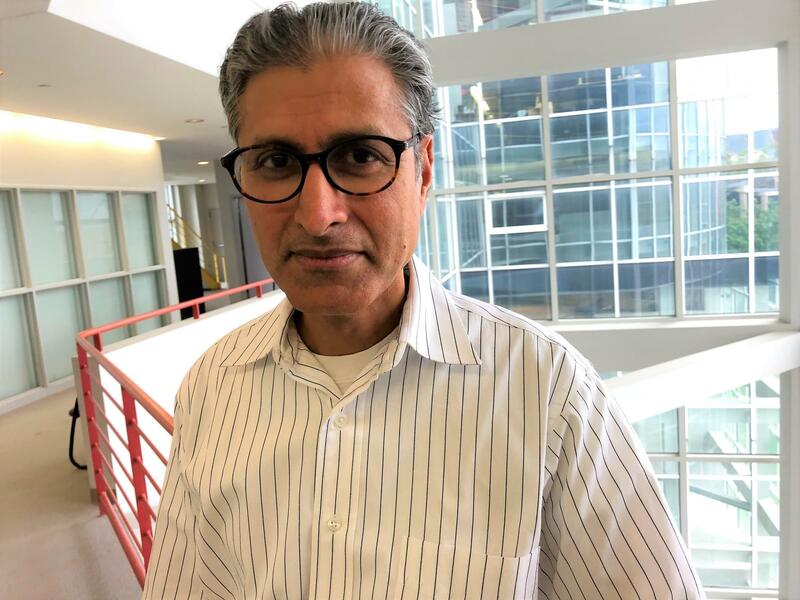 Ali Dhinojwala is the former director of the Polymer Science Department and current H.A. Morton Professor of polymer science at the University of Akron. We’re in the lab of polymer scientist Ali Dhinojwala, but we're not here to talk about polymers. Instead, he lays out a collection of bird feathers. We see shimmering blue feathers from a duck’s wing, tropical colors of bright green, orange, and yellow, plus the familiar brown hues of a wild turkey. 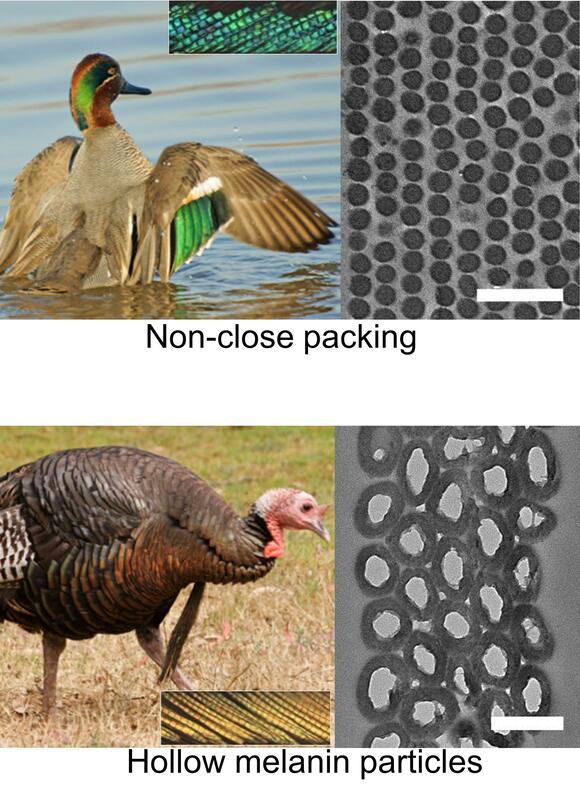 The arrangement of melanin particles in feathers provides a range of structural colors in birds, from iridescent green of the teal to the shimmering brown of turkeys. 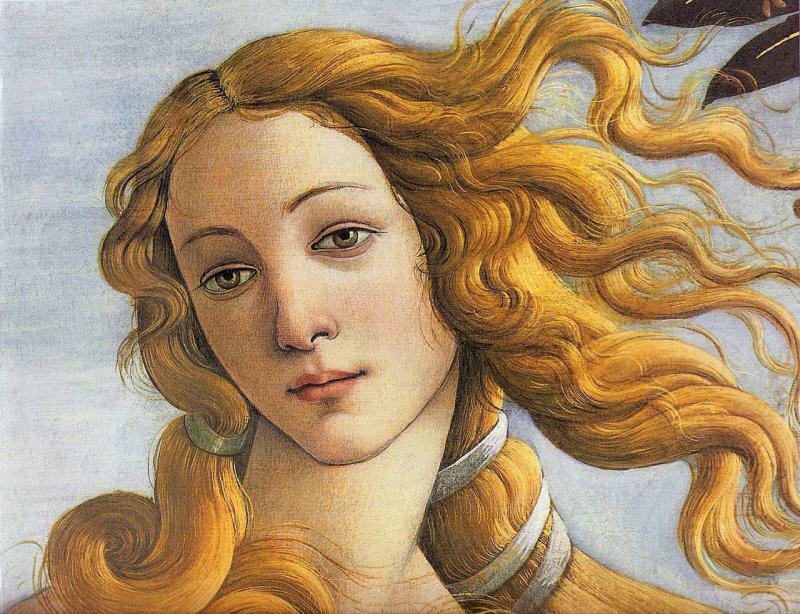 Keratin is the protein that makes up feathers, as well as hair, horns, and fingernails. Melanin is the dark brown pigment that gives color to our skin. Dhinojwala and his crew spent a couple of years examining how nature does it with former University of Akron colleague Matt Shawkey. Dhinojwala says that investigation led to, "ideas on how to create a synthetic analogue of the color that we see in birds,” a process called biomimicry. “This is the melanin,” says Dhinojwala, holding up a small bottle filled with a dark brown liquid. But instead of being coated with a layer of keratin as in nature, his team encapsulated the melanin particles in silica, basically a thin layer of sand. But how do we go from a dull-brown liquid to a vibrant color? Again, Dhinojwala looked to the birds for inspiration. But while birds are able to grow those structures in their feathers, his team had to find another way. Ali Dhinojwala and his crew at the University of Akron are from the left, Xiaozhou Yang, Weiyao Li, Dhinojwala, and Mario Echeverri. Not pictured is former grad student Ming Xaio, now at Harvard University, who spearheaded the project. Grad student Weiyao Li demonstrates the process. She adds a type of oil that partially mixes with the melanin solution and gives it a good shaking. The oil and water form a froth called an emulsion. 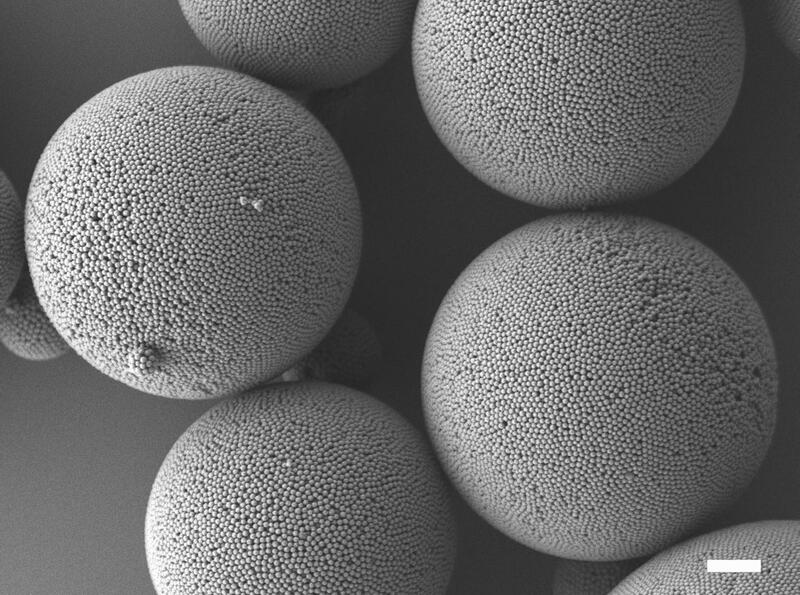 In the emulsion the silica-coated melanin particles become trapped in tiny droplets of oil. He shows me a high resolution electron microscope photo of the tiny spherical structures. Each one looks like a baseball made of BB’s. Dhinojwala says the little space between the smaller balls is where the magic happens. 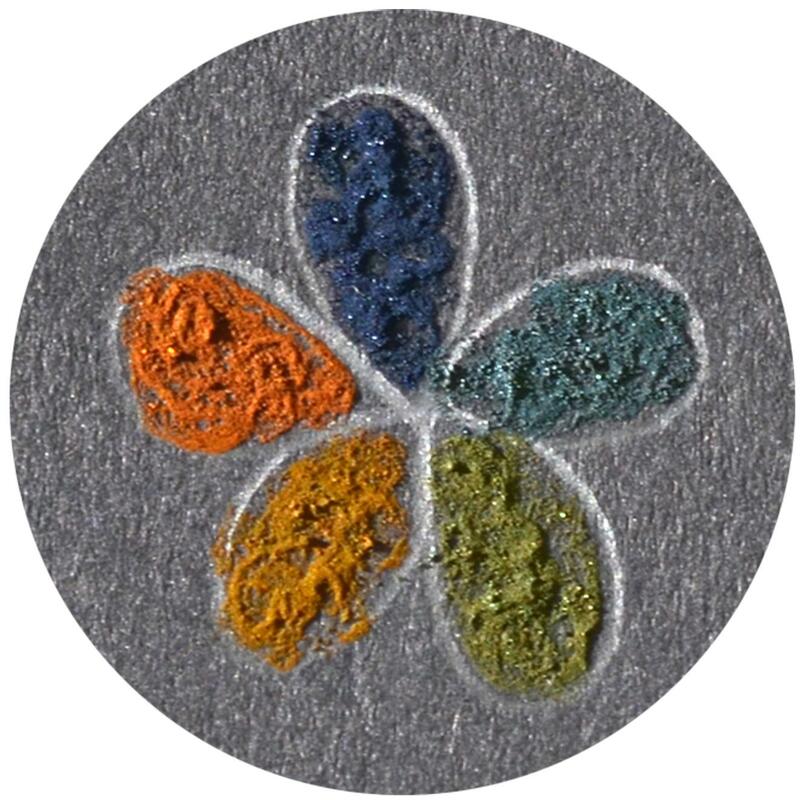 Laid out before us is a rosette of brightly hued powders - blue, green, red, and orange - all made from the same simple materials, melanin and silica. Nano-sized balls of melanin aggregate into clusters called supraballs. Melanin appears black in individual nanoparticles. But altering spacing of the nanoparticles in the ball scatters light to produce a range of colors. Dhinojwala says the color comes from variations in the thickness of the silica layer. Unlike pigments we see in paint and plastics, colors in nature are often what we call structural colors, meaning the color comes from the way light is reflected not from the pigment itself. Dhinojwala is excited about the possible uses for his bird-inspired colors. He says since it's food safe, we can eat the melanin pigments. He’s also gotten several overtures from major cosmetic companies. That UV protection has caught the interest of the Department of Defense. The powdered colors are all from the same material, but slight differences in the melanin supraballs give different hues. The colors are safe for food and cosmetics, and never fade. He’s part of a group that’s received an $8 million grant to unlock the mysteries of melanin and how it provides protection against the sun’s harmful rays, and other dangers, like radiation in outer space. “In fact NASA and other organizations are also very interested in properties of gamma protection that melanin has," he adds. But Dhinojwala says none of these uses were motivators for beginning the work. He says it was driven by curiosity, not outcomes. “It’s really a free-flowing thought process which has actually led us to this innovation,” he says. Dhinojwala says this process of open exploration is becoming more rare in academia and elsewhere, but the results, he says, can be extraordinary. 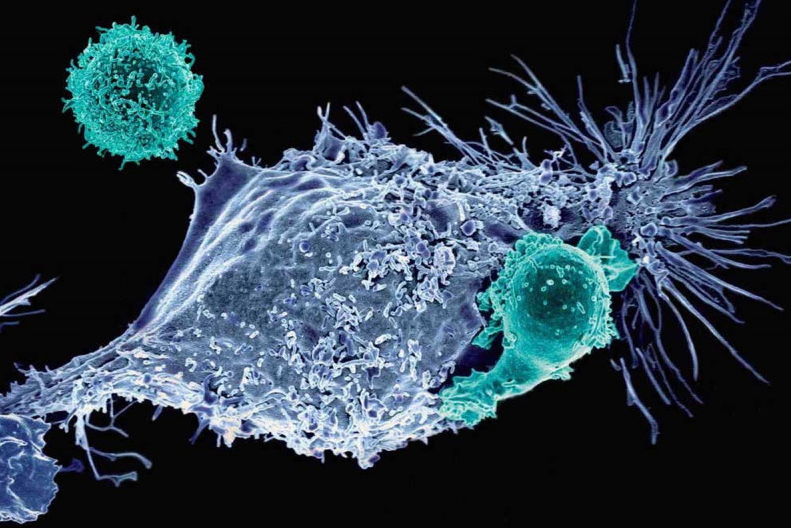 A new treatment for a type of childhood cancer is the first FDA-approved use of gene-therapy. It provides an alternative for patients who have exhausted all other options. In this week’s Exploradio, WKSU’s Jeff St.Clair sits down with two cancer physicians who are hoping to bring the therapy to Akron.